Hi! I’m Donna and I’ve worked at Footnote for over a year. Part of what I do is write Story Pages and other miscellany. Here is my Footnote profile. I found this interesting recommendation when I was annotating in the Confederate Amnesty Papers. 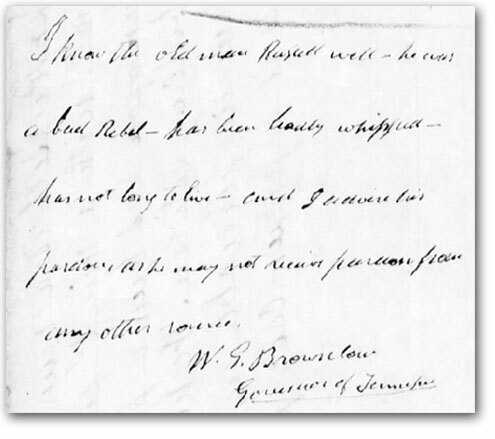 The Governor of Tennessee wrote, in behalf of John Russell’s application for amnesty, that he was an old man and a bad rebel. He continued that Russell “had been badly whipped and has not long to live.” You can see the entire case free here. The blog is well written. I enjoyed reading every word.